When people think of chickens, the last thing they imagine is a bird of that size gracefully floating in the air, soaring and swooping as they glide along in the breeze. And they would be right. This does not mean, however, that chickens are completely incapable of flight. If their wings are left intact, they can, and some will, fly over a seven foot fence and roost and nest high in the branches of a nearby tree. In fact, some chicken owners like to say that it’s less likely the foxes will come to their chickens and more likely the chickens will go out to meet the foxes. Many people have compared the flight of a chicken to the image of a winged boulder falling without any grace whatsoever.. and they are not far from the truth. 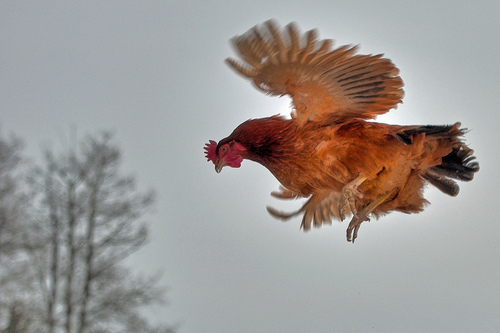 Chickens tend to flap wildly and without any real intent to reach soaring heights. Their wings are simply a method of keeping them “graceful” in their eyes. Without them a chicken is likely to have a small and harmless tumble upon landing- the only thing hurt is often their pride. Should you leave your chicken with their wings unclipped? There are people on both sides of this argument. Those living in suburban areas are better off clipping their chickens wings. It is a painless and relatively simple procedure. The hardest part, in fact, is catching your chicken so you can clip their wings. And clipping their wings doesn’t make them incapable of reaching a roost either. 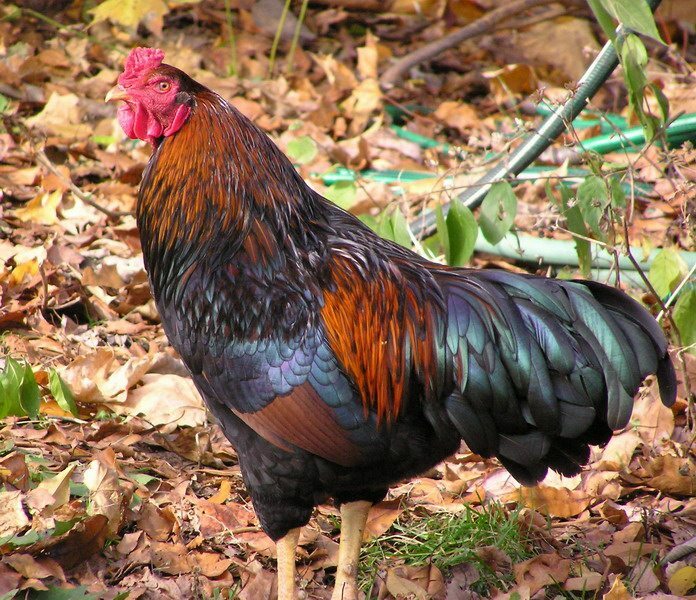 A chicken can easily jump over four feet without the assistance of their wings to lift them. On the opposite side of the argument, however, are those that have small, free-range flocks in rural areas. If a predator gets into the chicken area, the chickens’ ability to fly away may very well save their life. If a wild dog is chasing them, it is easier for them to move up and out of reach in a panic if, with a few flaps of their wings, they can reach a roosting spot that is six or seven feet high and three or four feet out of bite range. Our free-range birds had their wings clipped once to discourage the idea, but are now fully capable of flying across the yard (as one chasing me the other day proved). So what is the best way to clip their wings? Many feel that simply clipping one wing will give a chicken all the inability to fly that they need. 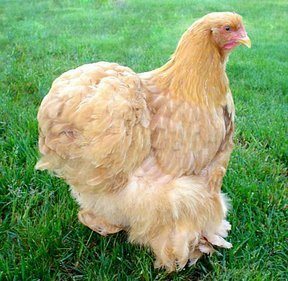 Like an airplane, a chicken must be symmetrical in order to get proper life. By clipping one wing, you make them unbalanced and flight is nearly impossible for the chicken. Likewise, when you clip both wings you remove the ability to even achieve the lift necessary to get anywhere and a chicken will simply fall back to the ground. So yes, chickens can fly… Or rather, they can reach higher heights to fall from if they have their wings intact. Will they ever soar high among the clouds? Probably not.